Relyence Maintainability Prediction supports the worldwide accepted standard for maintainability prediction analyses: MIL-HDBK-472. Relyence Maintainability Prediction is built on the accepted practices and procedures defined in MIL-HDBK-472. This includes all the building blocks used to perform an analysis: Tasks, Task Groups, FD&I (Fault Isolation & Detection) Outputs, and Maintenance Groups. Relyence Maintainability Prediction supports defining your own library of Tasks. At their core, Maintainability Prediction analyses are based on defining your maintenance and repair activities as a series of Tasks, or elemental, basic actions that are taken in response to a maintenance activity, whether as a corrective action or a preventive action. Tasks can be as low level as you prefer. The lower the level of detail, the more precise your repair activity list can be, and the more accurate your repair metrics. 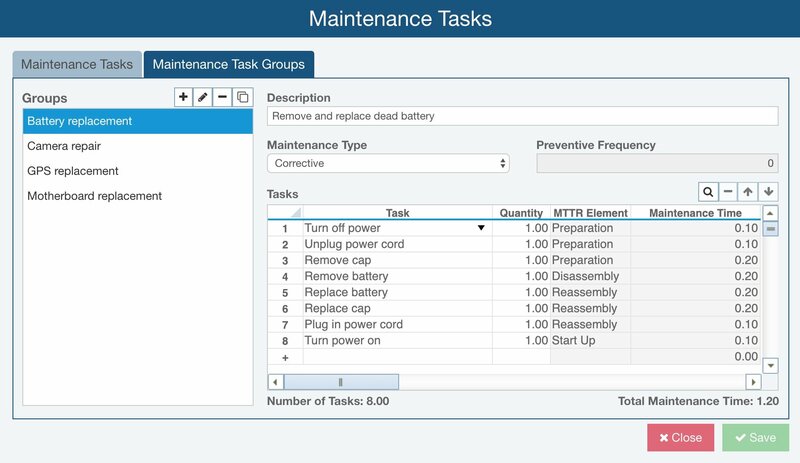 Task information includes data such as the maintenance type (corrective or preventive), the time, the number of people, and the MTTR element. Once you have a set of defined basic Tasks, you can combine Tasks into a set, or a Task Group. A Task Group is a series of Tasks completed together in order to perform a repair or maintenance action. 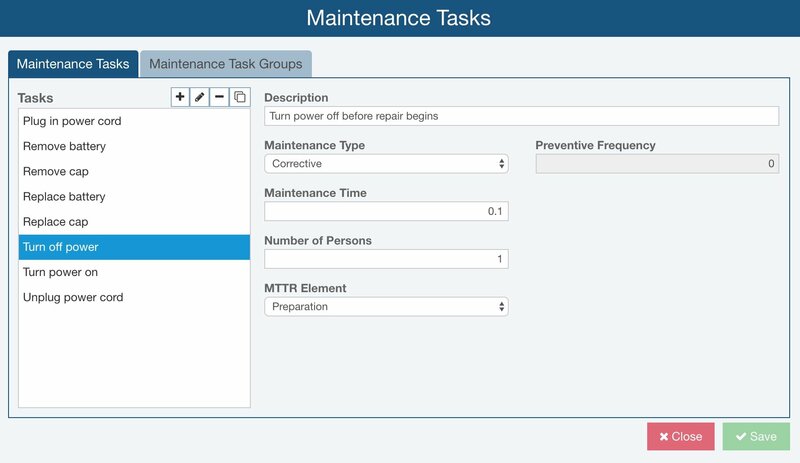 Task Groups can then be used to define a maintenance activity in a single step. You can define any number of Task Groups, which will automatically retrieve the underlying Task data when performing the Maintainability Prediction analysis. Relyence Maintainability Prediction supports defining Task Groups, or a set of Tasks performed together. Relyence Maintainability Prediction supports defining your FD&I (Fault Detection & Isolation) Outputs. In Relyence Maintainability Prediction, you can define your maintenance actions based on Tasks or FD&I (Fault Detection and Isolation) Outputs. Fault Detection and Isolation (FD&I) Outputs are the indications that identify to repair personnel the procedures to follow in the case of a failure. Common types of FD&I Outputs include BIT (built-in test) outputs, alarms, meter indicators, or any type of system alert. You can create a library of all your FD&I Outputs for use in your Relyence Maintainability Prediction analyses. 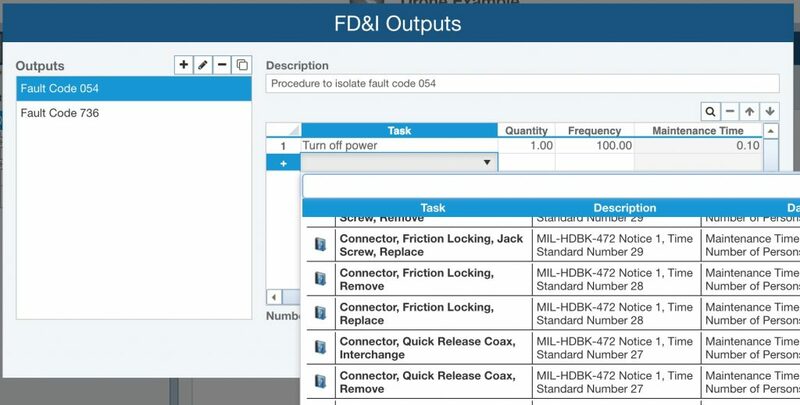 When using MIL-HDBK-472 Procedure 5 based analyses, your Maintenance Groups are used when performing calculations. Maintenance Groups define how a repair action is performed on a group of replaceable items. In Relyence Maintainability Prediction, you can define your Maintenance Groups and their associated parameters: repairable item access, replacement group philosophy, and if reassembly is required for checkout.